Download the DRDO Senior Technical Assistant B Syllabus 2019 from this site in PDF format. The higher authorities of Defence Research and Development Organisation (DRDO) are planning to conduct the Senior Technical Assistant B exam on the scheduled date at various examination centers. Defence Research and Development Organisation Syllabus 2019 is given here which will help you in the preparation time. Collect the drdo.gov.in Senior Technical Assistant B Syllabus 2019, and start your preparation as soon as possible. By making a prefect timetable, applicants can practice well. By practicing this DRDO Senior Technical Assistant B Syllabus 2019, competitors can secure the good marks in the exam. In the below sections, candidates can get more data on drdo.gov.in Senior Technical Assistant B Exam Pattern 2019, and रक्षा अनुसंधान और विकास संगठन Selection Process. To know about the DRDO Senior Technical Assistant B Recruitment 2019 aspirants can visit our web portal. Along with it, refer to this article and collect the syllabus for the DRDO Senior Technical Assistant B exam. To score the better marks in the test all the students need to prepare for the written test with the help of the DRDO Senior Technical Assistant B Syllabus 2019. 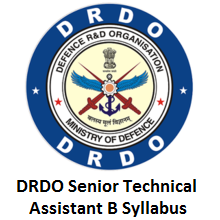 The DRDO Senior Technical Assistant B Syllabus 2019 PDF is now available on our portal. Along with that the Exam Pattern of DRDO Senior Technical Assistant B, DRDO Senior Technical Assistant B Previous Papers are also available on our website Sarkari Recruitment. DRDO Senior Technical Assistant B Syllabus 2019 is the crucial aspect to begin the practice for the written test. Therefore, all the hopefuls need to gather all the details for the examination. We have arranged the DRDO Senior Technical Assistant B Syllabus 2019 for all the positions in the below sections of this page. Candidates can find the link to download the syllabus along with the exam pattern. For the sake of students, we have collected and mentioned some important points related to the DRDO Senior Technical Assistant B Syllabus 2019 in the below table. The Type of the examination is Computer Based Test. The Tier I exam contains the 150 questions in Quantitative ability/aptitude, General Intelligence & Reasoning ability, General awareness, English language (basic knowledge), General science for the 150 Maximum marks. The Tier II exam includes the 100 questions in specific to the subject of postcode for the 100 Maximum Marks. The time duration of the Tier I exam is 120 Minutes and the Tier II exam is 90 Minutes. Aspirants who don’t know the exact DRDO Senior Technical Assistant B Syllabus 2019 and Exam Pattern, those people will not be able to perform well in the written test. Every year the officials of Defence Research and Development Organisation are releasing the latest syllabus. This entire post is useful to the participants who fill the application process for vacant Vacancies. Applicants, go through this page and gather the complete details related to DRDO Senior Technical Assistant B Syllabus and Exam Pattern. Even contenders can download the Syllabus PDF and Exam pattern from this article.